REQUIREMENTS: 500g Cosmetic soy wax, 200ml Coconut oil, Vanilla fragrance, Cinnamon Fragrance, Candle Wicks, 2 Glass bowls. METHOD: Melt the soy wax gently in the microwave or on the stove. Do the same with the coconut oil and then mix the two oils together. Then add 10ml vanilla fragrance and three drops of cinnamon fragrance. Position your wick in the middle of the glass bowl and make sure it stays upright by placing kebab sticks on either side. Pour your melted wax into the bowl. Leave to set. If you have some old tea cups and saucers lying around unloved, just use them for your body butter candles. They make extraordinary gifts. 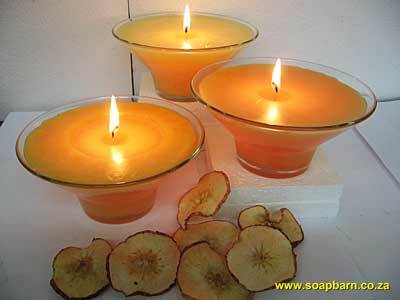 Using Body Butter Candles: Light the candle and let the wax melt. Use the warm melted wax to rub all over your body for the softest, smoothest skin.